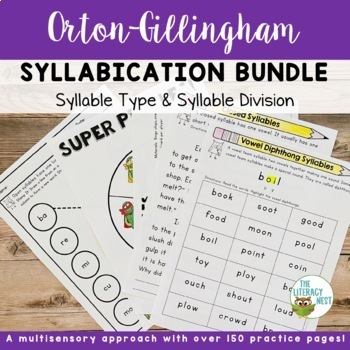 Write your Orton-Gillingham lesson plans and you will be ready to go with this extensive bundle of syllabication activities to support your instruction. Use this syllable types and syllable division BUNDLE for introduction or review of syllabication. 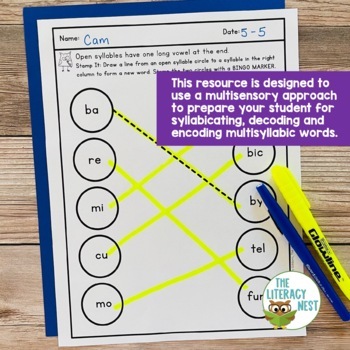 This resource is designed to use a multisensory approach to prepare your student for syllabicating, decoding and encoding multisyllabic words. Single syllable and multiple syllable practice have been provided in a variety of interactive ways. 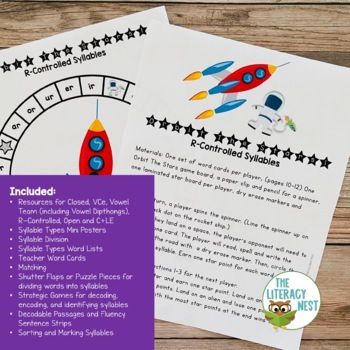 This growing bundle is compatible with the Orton-Gillingham approach, dyslexia intervention or other reading intervention programs. It may be used in a 1:1 setting, small group or even whole class, depending on your needs. Please be sure to download the preview FIRST to decide if this will suit the needs of your students. What is included in this syllable types resource? -A wide variety of FUN and strategic games for decoding, encoding, and identifying syllables! 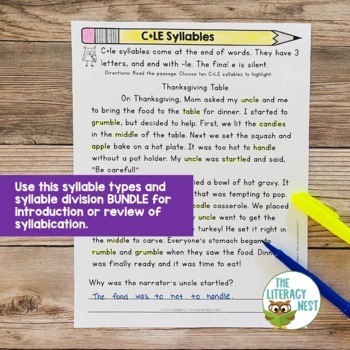 CLICK HERE TO SEE THE SYLLABLE RESOURCES INCLUDED. or download the preview. *IF YOU HAVE QUESTIONS OR CONCERNS ABOUT THIS RESOURCE, PLEASE FEEL FREE TO SEND ME A MESSAGE. THANK YOU!